Power Electronics (PE) are implemented in a wide variety of appliances, either to increase its controllability or energy efficiency, or simply because a DC supply is needed. The massive integration of rectifiers has resulted in a decrease of the supply voltage quality. Although PE have enabled the end user to control electrical machines, the resulting distortion inversely affects Direct On-Line (DOL) machines. In this paper a review is presented of the influence of these supply anomalies on Induction Motors (IM). The suggested problems have already been subject of much study. However, as new DOL technologies are emerging, for example Line Start Permanent Magnet Machines (LSPMM) or Induction Generator (IG) systems, the influence of supply distortion on these systems should also be considered. This paper will present a comprehensive overview of the loss mechanisms, the magnitude of the losses and the impact of these losses on operation of induction motor, line start permanent magnet machine and induction generator. Both due to economic and ecological incentives, energy has become a scarce product. The electric consumption is a significant part of the total energy consumption and consequently the complete chain of generation, transportation and usage of electricity should be optimized. The usage of electrical energy is often optimized by controlling the output of electrical equipment towards the desired value. Advances in Power Electronic (PE) energy conversion have led to an optimization of electrical equipment. Practical examples of PE controlled energy conversion are dimmable halogen lighting, low and high pressurized discharge lights, AC drives for Induction Machines (IM) etc. Additional to the advantages of PE in terms of energy optimization, a lot of PE is also used for DC supply in for example IT equipment, DC arcing or electrolysis. A lot of efforts are done to increase the efficiency of induction motor, however, distortion of the supply voltage does inversely affect the efficiency of induction motor. Although this effect is well known, it is often neglected or marginalized. If the actual limits of the supply distortion are taken into account, a reduction of efficiency of more than 1% is not uncommon. This one number also indicates that the influence of supply voltage distortion can undo a lot of efforts of motor efficiency enhancement. In Section 4 the influence of supply voltage distortion on induction motor is summarized and confirmed by measurements. 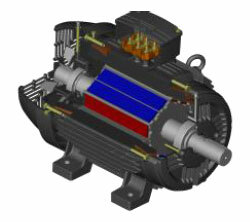 The efficiency of the standard induction motor is practically limited to IE3. This is due to the fact that the magnetizing power for the rotor has to be delivered through the stator. The integration of Permanent Magnets (PM) is one way to tackle the problem and still maintaining the DOL operation. If the motor would consist of only PM, the motor would be unable to start up at line frequency. The combination of PM with a standard induction motor rotor cage results in a machine which is able to start up as a standard induction motor and once near synchronism, the PM can synchronize with the magnetic field in the stator. This machine is commonly referred to as a line start permanent magnet machine. However, if the line start permanent magnet machine is to become the next evolutionary step of induction motor the influence of supply voltage distortion on line start permanent magnet machine should be addressed. Although attractive, in Section 5 it will be elucidated that straight forward comparison of the loss mechanisms for a line start permanent magnet machine and a standard induction motor can result in serious miscalculations and/or estimations. Electrical machines are responsible for 50% of the total electric consumption worldwide. For the industry the electrical machines consume up to 65% of the total electrical energy. Almost 90% of the installed power of machines that convert electrical energy to mechanical energy are induction motor. This essentially led to the machines being optimized for motor operation. Secondly, nearly all of the studies which examine the influence of distorted voltages are focused towards motor operation. Both consumption as electrical generation should also be performed with the highest possible efficiency and overall yield. The rise of decentralized production such as small wind, hydro, Combined Heat Power (CHP) or Organic Rankine Cycle (ORC) power, resulted in an increased interest towards Induction Generators (IG). However, anomalies in the supply voltage also affect the operation and efficiency of induction generator systems. Although induction motor and induction generator are the same machine, in Section 6 it will be illustrated that the use of induction motor loss models, derating methods etc, are insufficient to estimate the effect of harmonic distortion on the energy efficiency of induction generator. Estimation of end user voltage quality has proven to be difficult, as it is function of many parameters such as the loads connected to the grid, the grid impedance and the background distortion. In order to give some reference to the voltage quality, studies generally refer to the normative reference EN50160, which defines the voltage quality at Point of Common Coupling (PCC). This approach however does not include the distortion generated at the internal low voltage grid. Consequently, the voltage quality is overestimated, as is the overall energy efficiency of electrical appliances. This chapter results in concrete values and estimation guidelines of the amount of distortion of the voltage supplied at loads, taking into account both background distortion and internally generated distortion. These results will be implemented to give more accurate estimations concerning energy efficiency of electrical loads such as DOL induction motor. Most of the current distortion, and therefore the resulting voltage distortion, is generated by PE inverters. The combination of the grid impedance and the nature of the current distortion, namely single or three phase loads, will determine the resulting voltage distortion. The background distortion is limited by standards such as the EN50160 to 8%. 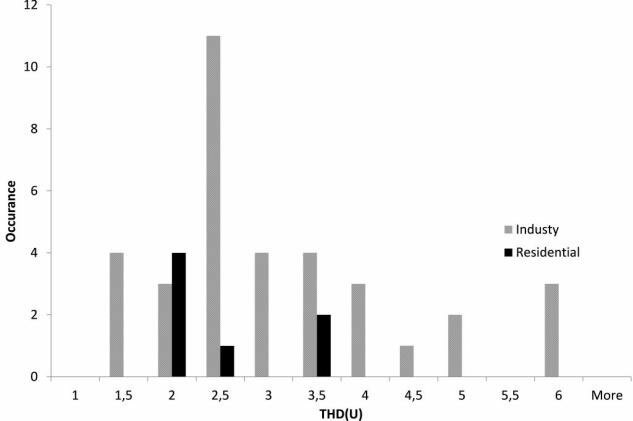 In order to have an idea of the actual background distortion, 42 measurements according to the EN50160 are presented for both large power industrial sites (35) and sites situated in urban areas (7) Fig. 1. If the generated distortion is superimposed on the already present background distortion, the resulting voltage distortion at end user can be simulated and the results are presented in Fig. 2. From Fig. 2 it is clearly illustrated that the limits of voltage distortion can well exceed the limits stated by the EN50160. A limit of 12% distortion can be calculated, while still complying to all the standards and design procedures. Harmonic mitigation equipment, such as active filters, can significantly reduce the current distortion ratio, consequently, this also suggests that active filters can have a positive effect on the resulting voltage distortion. 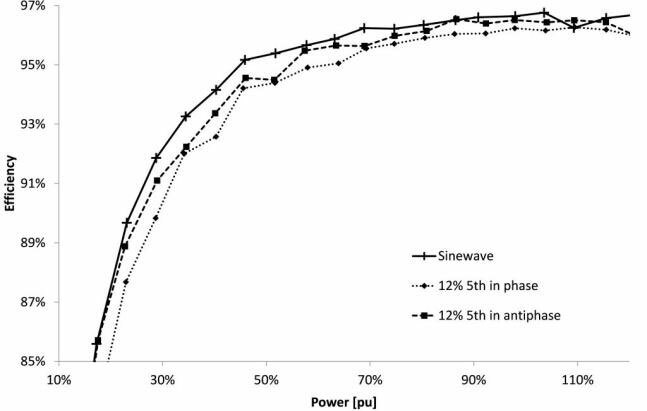 The effect of harmonic filtering to both the resulting current and voltage distortion has been monitored for 2 separate industrial installations and the results are listed in Table 1. The values of Table 1 are measured values, however, it is delicate to generalize or even predict the effect of filtering harmonic currents in relation to the present distortion. The influence of the filtering to the present voltage distortion is function of the filter settings, the physical location on site and the power relation between the installed filter and injected current distortion. Table 1 does indicate the positive effect of reducing current harmonics and the relation to the present voltage distortion. Currently, almost 70% of the world's electrical energy is consumed for electro-mechanical energy conversion and 90% of this power is converted by standard Squirrel Cage Induction Machines (SCIM). If the efficiency of induction motor's is to be increased this can be achieved at every design parameter of the machine. Fig. 3. Fig. 3: Impact of the possible areas for improving the motor performance. In order to uniform the efficiency of induction motor, the IEC has introduced a classification system (IEC 60034-30) which states the efficiency, from IE1 up to IE4 as listed in Table 2. Table 2: Rated efficiency levels for commercial 50-Hz, 4-pole LSPMSMs up to 7,5 kW and IE2-, IE3- and IE4-class limits defined in IEC60034-30/31. A lot of research is performed in introducing better active materials, such as in Diecast Copper Rotors (DCR) or increasing the performance of the lamination steel. Because an energy efficient machine dissipates less power, this not only results in a reduced power consumption or operating cost, additionally this implies a direct decrease of the operating temperature in the different motor components. From Table 2 it is observed that nearly every step of efficiency increase is varying approximately 3% points. However, these efficiency levels are valid for sine wave voltages. In the latter it will be pointed out that the efficiency reduction caused by voltage anomalies can significantly reduce the overall efficiency of an induction motor. If this reduction is within the same order of magnitude as the efficiency enhancement from for example IE3 to IE4 , this effect should be taken into account. The effects distorted supply voltage are numerous as it affects almost every single operational parameter of the machine, such as output torque, torque ripple, motor temperature, vibrations, bearing stress etc. However, as this paper focuses on the additional losses due to harmonic voltages, some key effects are listed. The higher frequencies force the current to flow on the outer rims of the conductor. This effect is known as the "skin effect". However, for induction motor this effect is predominantly present in the rotor bars and is accordingly addressed to as the "deep bar effect". This effect is far less pronounced in the stator, due to both the reduced section of the stator coil windings and the relatively low frequencies considered (<40 order of harmonic). The deep bar effect results in a reduced active surface area, which results in an increased current density towards the outer radius. This results in an increase of the rotor bar resistance. Subsequently, the top of the rotor lamination begins to saturate, and results in a decrease of rotor reactance. In terms of total harmonic current, the RMS value of the current is dominated by the RMS harmonic voltage and the total reactance at harmonic frequency, the losses can be calculated by Joule's law taken into account the skin effect. 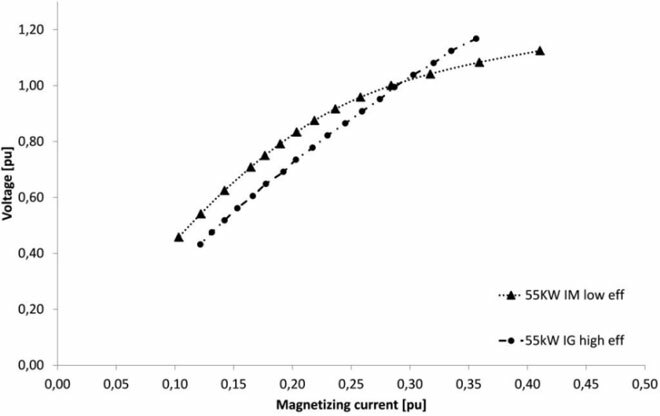 The total averaged voltage is influenced by the phase of the harmonics, accordingly this influences the magnetizing current. 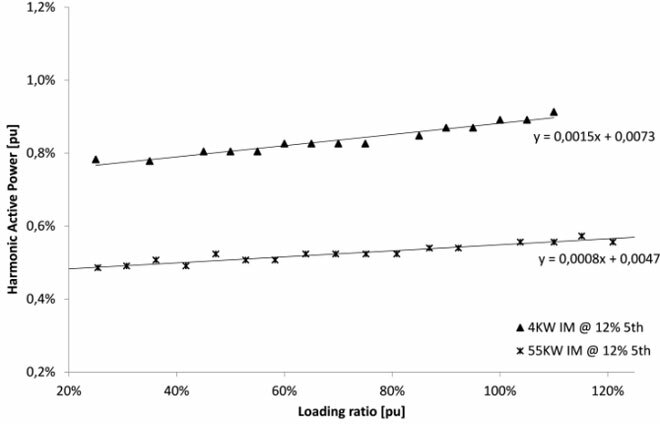 However, this effect is only measureable for low power ratings of machines and at partial loading. As the loading increased, the increased stator voltage drop results in a slight demagnetization of the machine. Accordingly a linear induction is assumed and the effect on the magnetizing current is often neglected. Harmonics also result in electro-magnetic power and consequently mechanical torque. In motor operation, voltage harmonics of hk>1=1-6k result in breaking torques. Because the magnitude of voltage distortion decreases with increasing order, and the damping of harmonics is increased with increasing harmonic order, all harmonic power is assumed to be additional loss. In order for an induction motor to cope with additional harmonic losses, the induction motor nominal power is reduced in case of severe distortion. Different derating methods for induction motors when supplied with a distorted voltage have been suggested. If the derating is necessary from a technical perspective, generally excessive stator heating, Thermal Based Derating has been suggested. If the actual losses are of interest, Loss Based Derating (LBD) is more convenient. Due to both the increase in distortion of the supply voltage, and the increase of induction motor supplied from AC drives, there was a demand for a relatively easy method of derating. Consequently, normative derating, such as the NEMA MG1 have been suggested which directly calculate the reduction of efficiency. 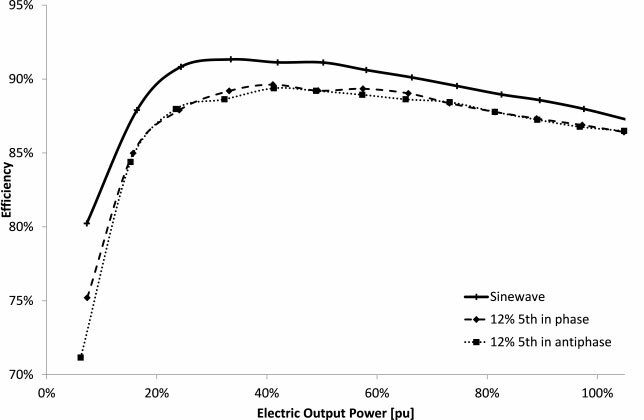 The goal within this paper is not to fully present the scientific details concerning the efficiency reduction caused by supply voltage distortion, but rather to present a comprehensive overview. As the influence of harmonic voltage distortion to the overall energy efficiency is inversely proportional to the harmonic order, it makes more sense to introduce a weighted voltage distortion ratio, rather than using the linear parameter Total Harmonic Distortion THD(U). With n, the odd harmonics, excluding triple n harmonics and Vn the p.u. value of the nth harmonic. From the HVF, and using Fig. 5 the Derating Factor (DF) can be obtained, accordingly the resulting efficiency can be calculated according to Eq.(2). With DF : the derating factor obtained from Fig. 5, η: de motor efficiency at sine wave condition and ηC the corrected motor efficiency in case of a distorted voltage. Studies have indicated that the normative derating methods present fairly good estimations concerning the reduction of motor efficiency. Subsequently, the absolute losses can be calculated, and combined with the correct knowledge of the thermal parameters of the motor, this can result in estimations concerning the temperature increase of the different motor parts. In Fig. 6 the temperature increase of different motor parts is presented for a 4kW induction motor IE2 at full load and supplied with a distorted voltage. Based on Eq. (2) and Fig. 6 some important conclusions can be made. First of all, from Eq. (2) it can be deduced that for increased efficiency of the induction motor, the susceptibility of the induction motor towards supply voltage harmonics reduces. Consequently, the same amount of voltage distortion will result in a reduced loss in both actual power [W] as in pu, if an IE3 is compared to a IE2 of the same rated power. 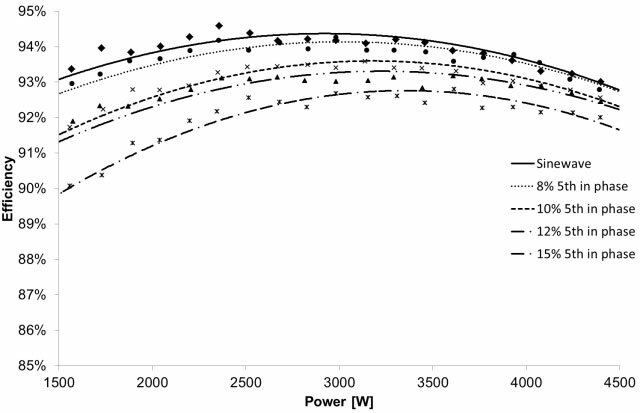 This also indicates that with increasing motor size, the harmonic losses in pu will reduce Fig. 7. 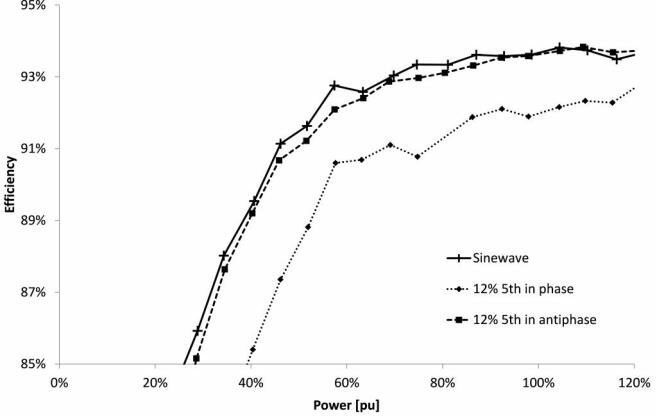 However, in terms of actual active power [W], there is an increased loss for higher power ratings. Secondly, harmonic modeling of induction motor assumes that the harmonic losses are nearly independent of the loading ratio. Measurements have indicated that the losses caused by harmonic voltage distortion slightly shift as function of the applied load. But harmonic losses are indeed present even at no load. This can have a significant cost if the motor is constantly unloaded. Fig. 7. The additional loss results in additional operating costs, but additional losses can also be evaluated from a technical perspective. Additional losses imply additional heating and thus harmonic voltage distortion could result in premature failure, generally accelerated stator winding insulation breakdown. However, induction motor are usually over dimensioned as the general load ratio is only 60%. Although according to Fig. 6 the additional losses increase, the operating temperature this effect is only to be taken into account at full load. At partial load stator winding temperature is significantly under the nominal temperature, even when supplied with a considerable distortion. To conclude it can be stated that harmonic voltage results in additional losses and additional heating. Although the additional heating can cause problems, this effect is only important for small machines (which have an inherent large thermal resistance from stator coils to ambient) and at full load. 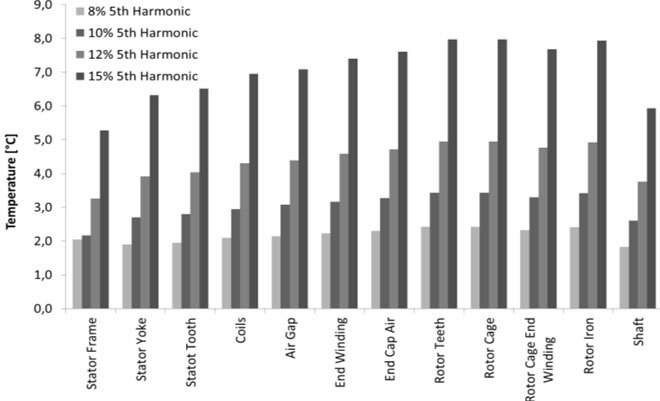 If the cost of harmonics is evaluated this is not negligible. It has to be stipulated that, according to Fig. 5 the losses are not linear to the applied distortion. This inversely implies that even a slight reduction of the distortion can result in significant energy savings. The integration of Permanent Magnets (PM) in the rotor reduces both rotor and stator losses as the magnetizing power for the rotor is no longer supplied by the grid. If the rotor consists of both PM and rotor bars, the motor can start as an induction motor and once near synchronism the Magneto Motive Force (MMF) of the PM can synchronize with the MMF induced in the stator. Consequently, these high efficient Line Start Permanent Magnet Machines have been developed from the mid-eighties and recently became an off-the-shelf product. Line start permanent magnet machine are often suggested as one of the possibilities to achieve IE4 or even IE5. A state-of-the-art review of both practical advantages and limitations of these line start permanent magnet machine's has been presented. If line start permanent magnet machine are to become an actual substitute for standard induction motor, the influence of voltage distortion on its overall energy efficiency should be evaluated. Literature concerning the influence of harmonic distortion on the efficiency and operation of line start permanent magnet machine is scarce. However, due to the similar configuration and operation to standard induction motor, it is tempting to straightforward adapt the loss mechanisms and models of induction motor. A more profound analysis indicates that, in case of induction motor, the effect of slip combined with the additional voltage drop over the stator impedance allows superposition of losses obtained by harmonic modeling. Contradictory, for a line start permanent magnet machine the use of superposition is prohibited, due to both the presence of PM and the synchronous operation. The supply voltage rarely holds one single harmonic imposed on the fundamental. If multiple harmonic distortions are superimposed on the supply voltage, certain harmonics will interact due to synchronous operation. Harmonic rotor currents, induced by stator harmonics of orders h-∞<k<+∞=1+6k, and with equal value of |k| interact with one other resulting in either an amplification or reduction of the resulting rotor harmonic current. If the phase angle of the different harmonics is shifted in reference to each other, the corresponding losses shift with a factor 4. A 4kW line start permanent magnet machine machine has been subjected to both 10% fifth and seventh harmonic content. The losses were monitored as the phase angle from the seventh and the fifth shifted in reference to each other. 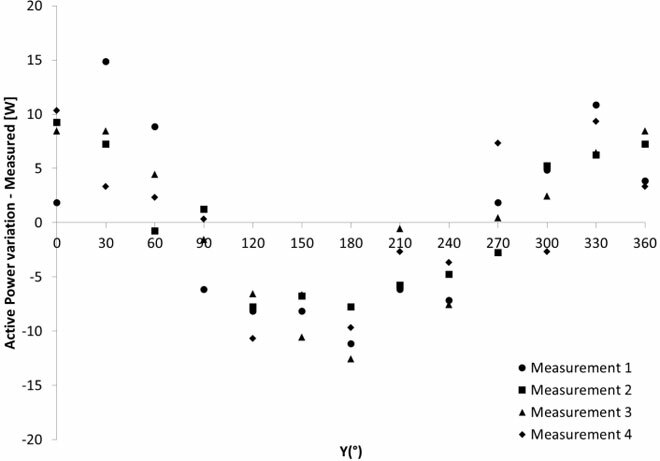 The total power loss was averaged, and the variation of the losses is plotted in Fig. 9. Fig. 9 does illustrate the interaction of individual harmonics and consequently discard superposition. The absence of rotor joule loss additionally reduces the stator joule loss. 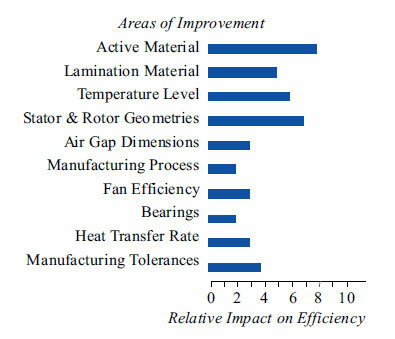 As the magnetizing losses become more dominant, the phase angle of the voltage distortion has significant influence on the overall efficiency of these machines Table 3. A 15% fifth distortion ratio leads to a reduction of efficiency of 1.2% for induction motor and a maximum reduction of 1.5% for line start permanent magnet machine. The previous evaluation indicates that line start permanent magnet machine are more sensitive to harmonic voltages in reference to induction motor. However, if the absolute efficiency is evaluated, the line start permanent magnet machine is still more efficient referred to induction motor. Due to the high power to weight ratio, its robust construction and line start capabilities is the Induction Generator (IG) still the preferred choice of energy inverter for certain types of CHP's, backup power or low cost Wind turbines. As the integration of induction generator continues to rise, the effect of supply voltage distortion on induction generator should be considered. The same effects occur in generator mode as in motor mode, however, similar to line start permanent magnet machine, the use of harmonic motor models is prohibited. Additionally, there are several practical considerations which have to be taken into account in order to practically test an induction generator under distorted supply conditions. Furthermore, as the mechanical speed is above the synchronous speed for induction generator, the frequency of the injected harmonic rotor currents also varies. The frequency of the current harmonics of order hk>1=1+6k will reduce in frequency in reference to motor operation. Contrary, in induction generator operation the frequency induced by harmonic orders of hk>1=1-6k will increase. Skin effects are often derived by measurement in motor operation, however, the previous directly implies that neither skin coefficient for neither resistance and impedance are still valid in generator operation. In addition harmonics of hk>1=1-6k do result in breaking torques in case of motor operation, however in generator operation this is a positive torque. From the previous it can be concluded that straightforward adaption of harmonic loss mechanisms for induction motor to induction generator can result in severe errors. Similar to the pitfalls of harmonic modeling, straight forward comparison between efficiency in motor and generator operation is equally delicate. In Eq. (3) and Eq. (4) the definitions of the efficiency are given for motor and generator mode. When evaluating the efficiency of induction motor in case of voltage distortion, identical output power can be easily achieved by loading the test machine with a machine controlled towards constant output torque or constant output power. The increase in electrical input power is a measure for the additional losses in case of voltage distortion. When motor and generator operation are compared, the following question arises. If a machine is designed particularly for motor operation, but used as a generator, what is the nominal induction generator operating condition and to which reference should efficiencies be compared? Both from a theoretical point of view, as from an design point of view, the general conclusion should be that machines are designed towards certain thermal limits. As the stator and rotor joule losses account for the majority of the total losses, it is logic to relate to maximum allowed current and therefore the nominal electric input power is often used as reference. If harmonics are imposed on the voltage, the mechanical power should be increased to obtain identical electrical power in reference to pure sine regime. The increase in mechanical input power Ph_mech is a measure for the additional losses and not the reduction of electrical output power Ph_elk. Note that this effect is more dominant as the efficiency reduces, especially for low efficient or low power ratings of machines. The previous also imposes practical difficulties, because the measurement accuracy is now function of both electrical and mechanical sensors, as are the practical tests more time consuming. 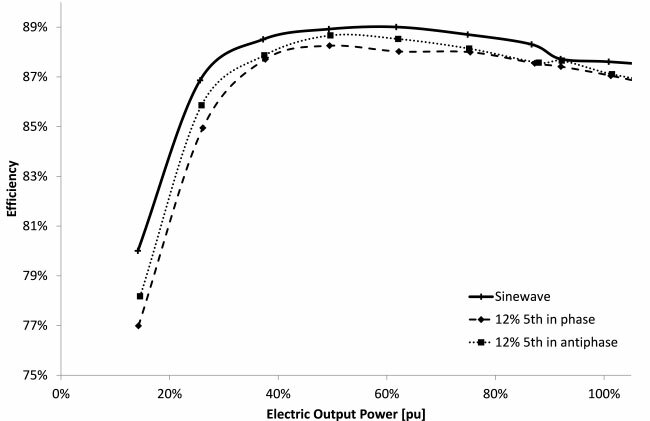 In this paper it is suggested that voltage distortion can have a significant influence on the overall energy efficiency of Induction Machines. In case of motor operation, this effect is well known, however in terms of energy efficiency the effect is often marginalized or even neglected. 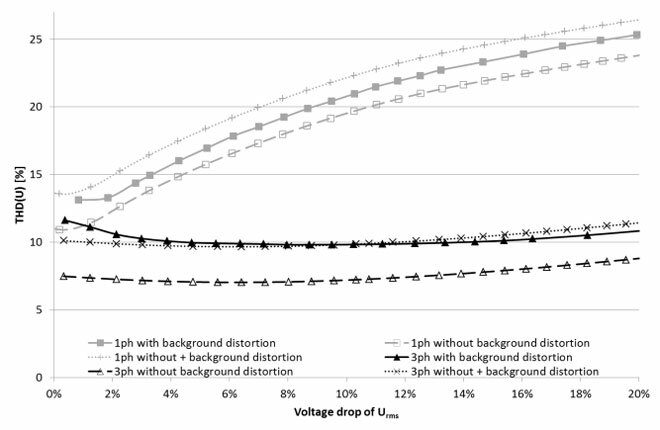 This paper starts by proposing limits to end user voltage quality, and it indicates that the supply voltage distortion can reach up to 12% while still complying to all the design guidelines and normative references. 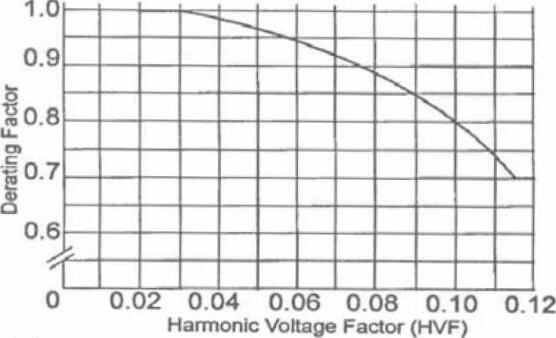 A supply voltage distortion of 12% fifth harmonic results in approximately a reduction of 1% efficiency. However, because the induction machine is a nonlinear system, even a small reduction of the supply voltage distortion can result in a significant energy reduction. Harmonic mitigation tools, such as filters or tuned capacitor banks could be mutually beneficial in both a reduction of the supply distortion and simultaneously the increase of energy efficiency of machines. As energy efficient electromechanical energy conversion is of key importance, new types of high efficient machines are suggested, such as line start permanent magnet machine. If line start permanent magnet machine are to become an actual substitute for standard induction motor, the influence of voltage distortion on its overall energy efficiency should be evaluated. Within the presented research initial steps are made, additionally, it has been stressed that harmonic modeling of induction motor is not applicable for line start permanent magnet machine. New models should be suggested and validated. Induction machines can also be used as generator systems. As the integration of induction generator continues to rise, the effect of supply voltage distortion on induction generator should be considered. Literature concerning this subject is thin and obtaining measurement results has proven to be difficult. Similar to line start permanent magnet machine is the use of harmonic models of induction motor prohibited for induction generator and more detailed loss modeling is needed. To conclude, the line start permanent magnet machine could also be used as an generator system. Due to its self-excitation, the high energy efficiency and its line start capability, line start permanent magnet machine could be promising for "low cost" and "low maintenance" generator systems. Within this research no measurements are presented concerning the influence of supply voltage distortion on line start permanent magnet generator, although this is subject for further research.